It can be tough to find the right home. In a fast paced market you have to know exactly what you are looking for in order to act fast and make an offer. We advice that you start by separating what you WANT from what you NEED. What do you NEED in a house? What do you WANT in a house? The questions may be phrased differently like, "What else would you like to have" but it means the same. What would you like to have that is not an absolute necessity. 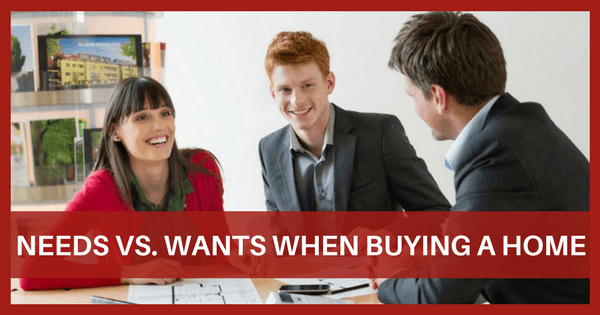 Here’s how you can distinguish your needs from wants when buying a home. Picture your ideal location. Now, where is it and what makes that location special to you. Location is very important. Being close to work or in a certain school district can be a need. You may want to live up on Snob hill, but you might be able to get a home at the bottom of the hill, and still be in the nice school district. Now the price. Since you may not be pre-approved yet, this can be your monthly payment. Set a hard monthly limit you can afford. You may be approved for more but may not want to spend that much every month. Think of the features that you absolutely need in your home. These would be things like a bathtub vs a stand up shower, wheelchair access, zero entry front door or shower, single level home. If at any point you are going through features and say "that might be nice", that is not a need. It's a want. Also keep in mind that may things in a home can be changed very easily. We live in a DIY era now and Pinterest is awesome! A value item in real estate, is a feature that adds value to your home and helps maintain resale value. When looking at your needs vs. wants, it’s a good idea to consider the value items with more weight than other things that are personal preference. You may care deeply about having a pool and think it adds value. Well sorry to burst the bubble but North Idaho is full of lakes and pools are expensive and high maintenance. Many buyers might shy away from owning a pool and see nothing but a chore rather than a value item. Buyers with children may even consider them a safety hazard. Items that add value in real estate include dual-pane windows, granite counter-tops, hardwood floors, land, nice landscaping (but don’t forget you’ll have to maintain it) and even intangibles like a beautiful view and being in a top-rated school district. A great Realtor can help you determine the difference between a valuable item/feature and a personal touch. When you prepare to buy a home, remember that no home you look at will be perfect. You will always end up making compromises. But with a good understanding of what you need, what you can live without and what will add value to the home, finding the right one will be easier. We tell our clients to create a home buying checklist of the features they need and want so we can help them determine what’s feasible within their budget. The Adair Real Estate Team are full service Realtors in Coeur d'Alene ID. Give us a call if you are buying or selling real estate in Coeur d'Alene or North Idaho.